Stats for this tournament can be found here. As one can tell with a quick eye test there are numerous problems with these statistics, as bonuses and player stats are not entered for some late rounds. Thus it is difficult for us to use this tournament as fully as most in looking at how this reflects the state. However, there are still things worth mentioning and it seems like there was lots of close play. Allderdice claimed their first ever tournament win in program history, defeating DuBois in the finals coming in with disadvantage. They benefited from captain Jordan Abbott’s 60+ ppg work, plus a nice breakout from Jahnik Kurukaulasuriya as a wingman. On three occasions, they scored 460 points or more in a match, so this was not a team scraping by on luck. DuBois, despite the loss, is gaining ground extremely fast in the state. Their bonus conversion skyrocketed from middling to excellent in the span of a month (though note this was a lower-difficulty set), and captain Eli Kirk’s 97 points a game is an excellent performance. Also in the playoffs were perennial Western PA powerhouse Winchester Thurston, sending two teams to the high brackets. They were missing a few players, but even when not at full strength they can absolutely compete for some tournament titles. Jack Chaillet’s 124.21 points per game is the highest non-Alex Schmdt score we’ve seen so far this year from any Pennsylvania player, and deserves to be singled out. With Jack in the lineup Thurston will always be dangerous. Rajan Alagar competed alone on behalf of the Alagar Homeschool. In so doing he also cleared 100 points per game and established himself as one of the state’s up-and-coming names to watch. The last playoff entrant was Norwin high school, who debuted on the Pennsylvania circuit last season, won their very first tournament, and then struggled. The struggles ended here, and Norwin’s first effort of the ’15-’16 season showed some nice potential. Other entrants were many of the same teams we saw at Mellon Bowl. We’re glad to see so many teams attending tournaments with ever increasing regularity and getting more great buzzes in. Of the rest, I’ll single out South Park high from Allegheny county, as this was their first ever pyramidal quizbowl event. We welcome them to the PA quizbowl family and hope to see them again very soon! So you’ve been studying hard and putting in solid efforts at practices, and you’re ready to go play a quizbowl tournament. How should you approach it? In my time playing I’ve found that generally it’s the amount of work you put in studying and learning clues that make the biggest impact on improvement, but there are some little things you can do at the tournament itself that can help you potentially step up your game that little bit more that you may need. Here are my five tips for improving as a player with regards to what you can do at the tournament. 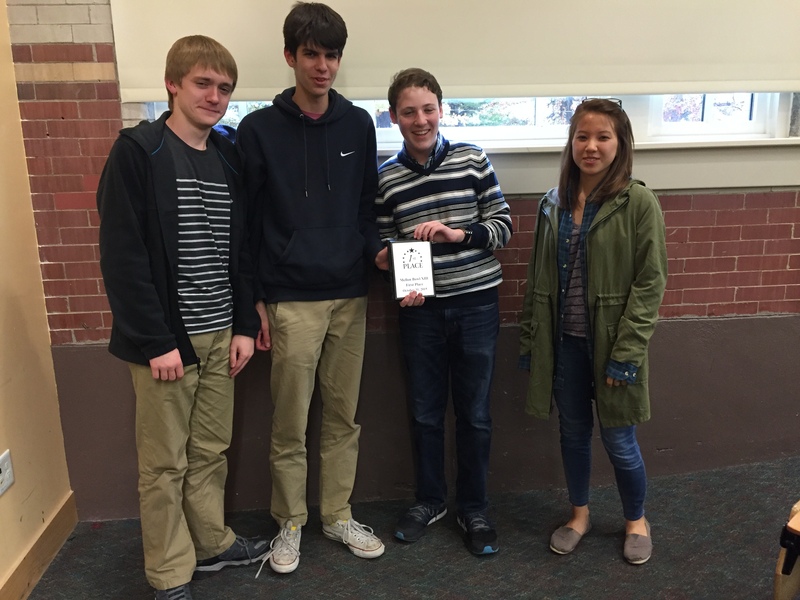 One unavoidable fact about quizbowl tournaments is that they are long endeavors. By the end of my first tournament, my teammates and I were totally exhausted, and it definitely affected our performance down the stretch. A great way to avoid that is to bring snacks. You don’t need anything fancy, just something to keep your mind and body energized enough to focus throughout the course of the day. Since that first tournament, my teams have always had a big bag full of different kinds of snacks (Fruit Gushers, Cheez-Its, and granola bars have been common) with us for when we need some refreshment. For a big end-of-the-day match, a little nourishment can go a long way. Bring a notebook with you to every tournament you play. Taking notes at tournaments is not only important in terms of getting a better idea of potential topics to study, but also in terms of keeping yourself engaged throughout the course of a match. It promotes focusing and prevents the day-dreaming that can sometimes happen (or at least I’ve found that it can sometimes happen). And, of course, don’t forget to look back at your notes after the tournament. This can be hard, especially early in the season, but once you see a team enough times you get an idea of what they are and are not good at, and you can harness this to your advantage. For example, if you know the team you’re playing against is strong in literature and you have a pretty good idea of the answer on a literature tossup, go ahead and buzz in. If you let it go and they get it, that’s much more likely to make a difference than losing 5 points when they probably would have gotten it soon anyway. Conversely, if you know you’re playing a team that’s weak in literature, you can probably afford to wait a little longer until you’re very sure of the answer. Here, you’d rather wait a little longer and ensure you pick it up rather than throwing your chance at the question away with an early neg. As this season and future seasons roll on, you’ll be able to better use these ideas. This is something that teams, especially new teams, sometimes do, and it’s really a shame when it happens. You don’t get any extra points for answering the bonus early, so let the moderator read the whole thing, just to make sure you hear the whole question. Make sure everybody has a chance to voice their opinions on the answer; few things hurt more as a captain than giving a wrong answer and realizing that the right answer was something one of your teammates was trying to say. A good moderator will clearly denote the amount of time you have and ask for your answer when it is up. Use as much of that time as you need to try to come to a consensus among your team. Or if you’re the captain and your team can’t come to a consensus, use your discretion as best as you can. Just try not to rush it. I know this sounds trite, but really the biggest thing you want to make sure of at a tournament is that everyone has fun. Keep things light-hearted, make some jokes between matches, do whatever you have to do. There’s a wide variety of ways to do this, so just remember this idea and do whatever works for you and your team. Please let me know if you have any feedback or comments about these ideas. I hope these tips can help you and your team perform better at quizbowl tournaments and have a more enjoyable time in doing so! At the same time as Henderson this weekend, several schools out of Northeast PA ventured to the Finger Lakes Region to try their hand at the same group of questions (IS-150). The tournament was won by the home team, with Ithaca High continuing to look like a potential National Title Contender. Let’s look at the highlights for our Keystone State squads. Delaware Valley A continued to look like a state title contender, finishing 3rd with a 10-1 record. A browse of their statline shows some impressive things: an average margin of victory of 300 points is nice, and 22.19 points a bonus is elite. However, there’s a couple of red flags: a lower power rate than last time, and a kind of absurd 32 negs, which is almost three a game. It’s tough to say if that was a fluke or not, but that does leave Delaware Valley open to lose matches they shouldn’t. They’ve got as much knowledge and depth as anyone though, so they could well overcome this. One of the more interesting teams to watch statistically in PA this year. 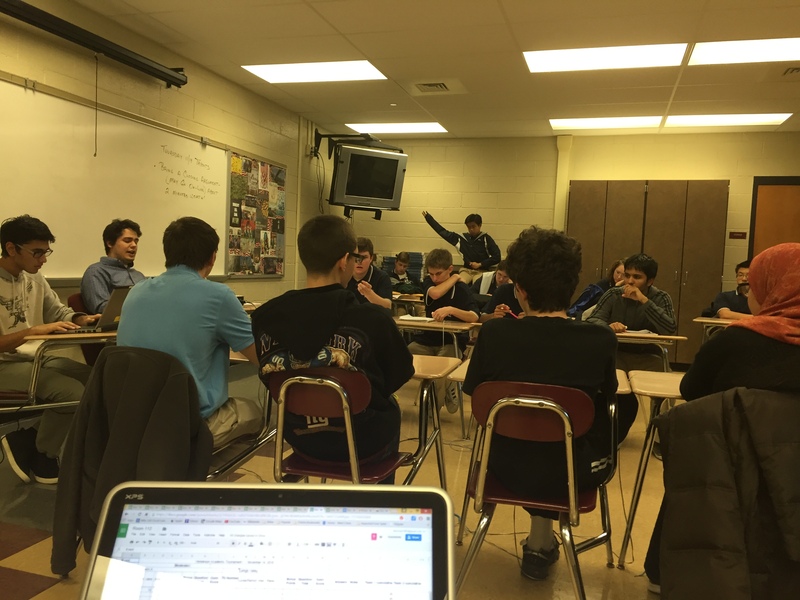 Lakeland continued to establish themselves as a good new team to factor in to your picture of quizbowl in Pennsylvania. They finished 5th, had a few quality wins along the way, and hit the 300s in several matches. Wallenpaupack wins the most improved award, jumping over five points per bonus from last month. This is another new team getting firmly established and I think they’re going to be a really good squad in the near future. Moravian Academy and Mountain View also made the playoffs. Neither of these schools had an easy time, winning lots of pitchers duels, but wins are wins. Congratulations should be sent their way for going deep in as schools with little invitational experience. Lastly, we must mention Wyoming Area A and Berwick, who also competed. These teams are building up for the first time, and I expect good things soon. Northeastern Pennsylvania is perhaps the area of the state improving the fastest, both in numbers participating and in quality of play. We hope to see more tournaments out there in the near future! Holy cow, was this a good one. Not a whole lot of schools were in tow (9), but this tournament in West Chester made up for it with many action packed nail biters and an absolutely stacked field, with 10 of 24 teams clearing 17 ppb and lots of high drama bouts. Manheim Township A came out with an undefeated first place finish. Garret Anderson swapped in to join Jake, Ahan, and Shayar on this conquest. The results were quite fine, as the Blue Streaks were not seriously threatened until the Championship match and won six games by a margin of 400 points or more. That, my friends is dominance. 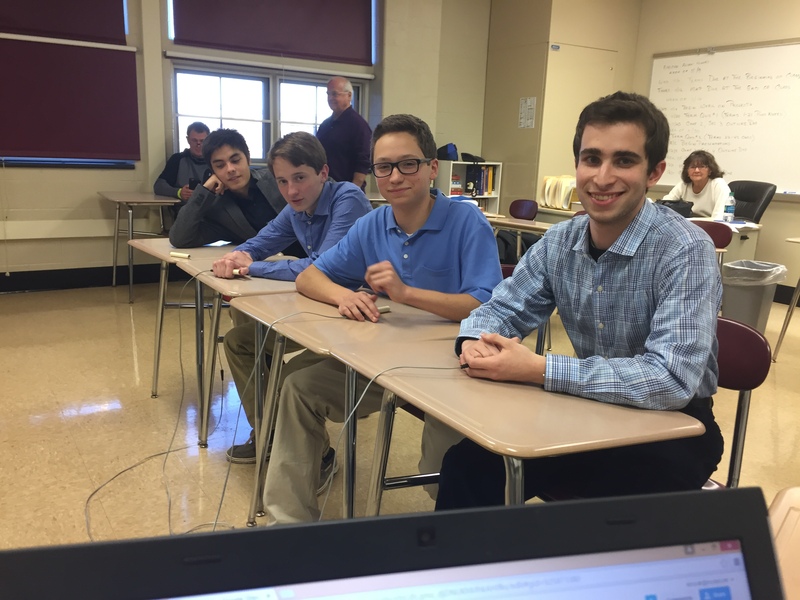 In the finals they faced Lehigh Valley Academy– and we can say that as a whole school this time. Alex Schmidt had three teammates with him, which was great to see. LVA also entered the final undefeated. The road was narrower than for Manheim, with a close prelim game against Cedar Crest A and a 30 point squeaker against Manheim Township B along the way, but nonetheless an impressive day. Alex broke his own Henderson Invitational points per game record with 168 ppg! From a sophomore! That kind of dominance is rare indeed. The final itself was a classic. Manheim Township triumphed, pulling ahead on the last question to win 340-310. Manheim shot out to an early lead (200-35 after 8 tossups), but Lehigh Valley chipped away to peek 20 points ahead on the 17th tossup. Manheim got two of the last three to avoid the upset. These are both dominant teams which have already achieved a lot this season, and will achieve more. The fantastic, unforgettable final in progress. Lehigh Valley Academy is closer to camera. The 3rd and 4th place finishers, Great Valley A and PALCS A, deserve plaudits of their own. PALCS won a matchup between the two in the morning, but Great Valley avenged this with an equally exciting 305-245 win in the 3rd place match, which was also separated by just 15 points going into the last tossup. I thought both these teams had lots of pre-season potential, and both appear to have realized it. Their MVPs (Sam Scarfone for GV; Gianni Manginelli for PALCS) put up big time points and established themselves as some of the state’s top players. Their respective help (Everett Beuaregard, Daniel Chen, and Deakon McCurdy for GV; Alex Gustafson, Zane Kodama, and Ethan McPeak for PALCS) was also fantastic, not a single player on these squads had less than 15 points per game yesterday. Well done all around! Manheim Township’s B and C Teams took the tied-for-5th spots, showing the absolutely insane depth they have. They’ll be contending for years. Cedar Crest competed outside Lancaster-Lebanon league play for the first time this season, and performed well. They’re not quite as consistent as some teams, but they are losing close games to good teams- the breakthrough could well come by the spring or next year. Depleted by losses of excellent seniors, West Chester East, Downingtown East, and Emmaus all took steps back from last year (each was ranked by this site at one point or another last season). While not contenders, none of these schools are weak by any means, with good buzzes all around. Hopefully they take advantage of rebuilding years to study hard and improve further, since there’s plenty to work with. Last but not least, one of the circuit’s newer squads, Renaissance Academy, sent three teams to play. Their inexperience led to some struggles, but their teams won games late and there’s many many students involved. Give it a year or two of playing invitationals and I have no doubt Renaissance will be highly competitive. Thanks to all the teams for competing! So great to work with sharp kids on Saturdays! In our forth episode, GPQB’s Ben Herman sits down with Victor Prieto, a prolific writer of science questions for high school and college tournaments, to discuss the question writing process, both in general and in the sciences. We cover why people should write, some specifics of how the science canon is constructed, and advice for new writers. 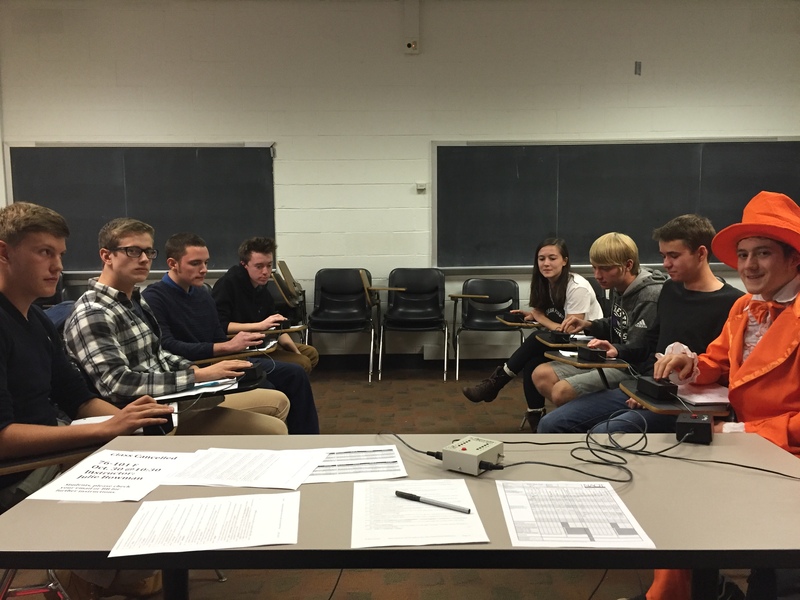 Carnegie Mellon University’s annual Mellon Bowl has long been one of the premier quizbowl events of the Western half of PA. This year’s Halloween incarnation did not disappoint. A field of teams from many different high schools in the Pittsburgh metro and beyond showed up to compete, and the competition was very fierce with many good matches in the prelims and playoffs. One team dominated the proceedings: State College A. They went 11-0 and cleared the field by two wins, so there was no final for the tournament this year. Their stats were a bit lower than at Princeton, but they were missing Mahima Kumara, their best player at that tournament. A balanced four person effort from the team sealed the win. While some of the final scores of their playoff rounds were fairly close, they won every match by triple digits and were never particularly threatened. State College kept on keeping on with their potential state title run, and I think our image of them was reinforced, not changed. Two teams finished 9-2 to tie for second. One was Winchester Thurston A, who reaffirmed they are still among Pittsburgh’s best squads. Jack Chaillet led the event wit 83.64 points per game. Their bonus conversion was close to 20 points per game. EJ Eppinger, rocking a snazzy bright orange suit for Halloween, has emerged as big time backup for Jack. He had to leave after lunch, which may have contributed to Thurston’s upset playoff loss to their fellow 2nd place finisher Alagar Homeschool. This family of siblings is newer on the PA quizbowl scene and flashed mighty potential. Rajan Alagar’s 25 powers led the tournament pack. I think, noting EJ’s absence and lower bonus conversion for the Alagars, that Winchester Thurston remains Pittsburgh’s top team, but they’re up and coming. I’m exited to see what the Alagars do next. Other stories on the day include a strong 4th place finish for Allderdice, affirming they are also a factor in this region. Captain Jordan Abbott’s 54 points a game were a big help, though Allderdice’s 30 negs in 11 rounds hurt them a bit. The knowledge seems to be there in increasing amounts, so with some discipline, Allderdice could go far. Camp Hill got to the playoffs with an undefeated morning. This surprised me, but was pleasing to see. The small Harrisburg area School has tricks up its sleeve. DuBois, traveling down from Clearfield county, made the playoffs behind a 68 ppg performance from Eli Kirk. They didn’t have quite enough firepower to defeat any Pennsylvania teams in the afternoon (though they did defeat Ohio’s Warren G. Harding high), so they’re not in Western PA’s elite quite yet, but they have gotten better as years go on, so DuBois is another program I’d have my eye on based on a strong morning. DuBois (L) and Winchester Thurston A (R), just after a close prelim bout. Other participants included Pittsburgh area regulars Hampton, Keystone Oaks, Indiana, South Side, and Shady Side, who finished in the middle of the pack. It was good to seem them on the buzzer again. Of these I only saw the A team from Hampton, who may not have had the firepower to get lots of fifteens, but did a very good job at keeping efficient, not making mistakes, and picking up solid buzzers before “for ten points”. Also of note were a few newer teams: Eden Christian Academy, Pittsburgh Catholic Central, and Yough (making their first Mellon Bowl appearance in a decade). They all won at least three matches, which is a great base to build on. It will be interesting to see who studies hardest and shoots up the standings fastest. Western PA quizbowl currently seems to have an excellent parity, which makes for many exciting matches. This was my first time staffing a Western Pennsylvania tournament, and I hope to have the chance to read for all these schools again in the future! How do I start a Quiz Bowl team? How can I get better at Quiz Bowl? How do I Host a Quizbowl Tournament?